Dodgers release Carl Crawford, making him a free agent. 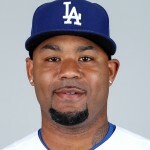 The Dodgers formally released Carl Crawford on Monday after the veteran outfielder cleared waivers. Crawford is free to sign with any team, though the Dodgers are on the hook for the remainder of his contract — the pro-rated amount of $20.75 million this season (roughly $13 million) and another $21 million in 2017. Crawford, 34, slashed .185/.230/.235 in 87 plate appearances this season. He was designated for assignment June 5, the second high-priced contract the Dodgers have eaten in as many weeks. Alex Guerrero, who didn’t play an inning in the major leagues this season, remains a free agent. Crawford was acquired along with Adrian Gonzalez, Josh Beckett and Nick Punto on Aug. 25, 2012, in what remains the largest trade (by money) in franchise history. Only Gonzalez remains on the Dodgers’ roster.